The depictions of St George that we have looked at so far in this series all show him as slayer of the dragon, whether active or passive in his actions. However, the legend of St George has many more facets to it than that. In fact, in the earliest versions of the tale the dragon does not even appear. The basic medieval legend tells that St George, a Christian and an officer in the Roman army, refuses to sacrifice an animal to the Roman gods. Because of this he is detained and tried by a heathen emperor. He undergoes hideous torture but continues to refuse to sacrifice, inspiring many onlookers to convert to Christianity. Eventually, he is beheaded and the emperor dies immediately afterwards. There are many variations on this, but the first appearance of the dragon episode was not until the tenth century. Nevertheless, it obviously caught the imagination of the masses, leading it to become the main story associated with the saint. In the medieval period the martyrdom legend appears to have been as well-known as the dragon legend. 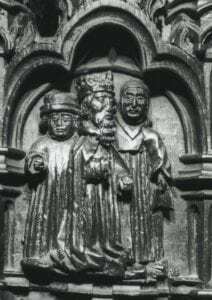 In St George’s Chapel both of these legends are intertwined in the elaborate medieval woodwork in the quire. 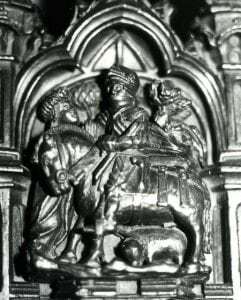 Ten of the scenes carved into the popeys (desk-ends) on the south side of the quire feature St George. Whilst depicting most of the narrative of the martyrdom of St George, they are not in any apparent order. However, we shall examine the story in chronological order here. 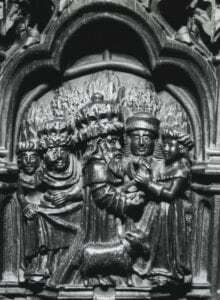 This is followed by a scene depicting the princess leaving her parents leading a lamb to go and be sacrificed to the dragon that terrorizes the town. 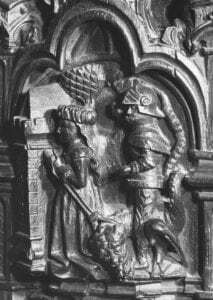 St George meets the princess and offers to slay the dragon. 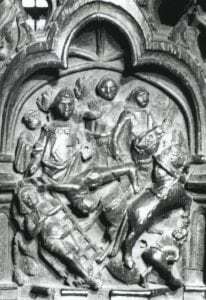 The figure on the right (presumably St George) in this image has been badly damaged, but it is possible that the scene depicts St George demanding the conversion of the town to Christianity in recompense for killing the dragon. The princess leads the dragon towards town, with St George standing astride it. 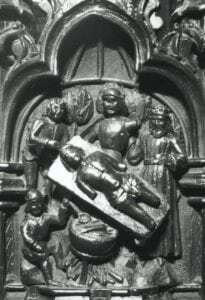 St George then appears lying on a board whilst he is dismembered and his body parts are boiled in a cauldron. He is subsequently about to be divested of his armour. 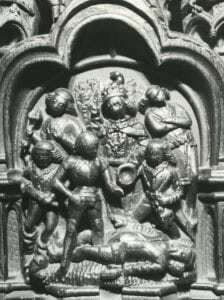 Finally, it appears that he has been poisoned but that this has had no effect, as the king holds a bowl and St George stands over a prostrate man who has presumably tested the poison. Then he is tied to a hurdle and dragged through the town. Unfortunately, there are some scenes, which are included in almost all other medieval depictions of St George’s martyrdom, missing from this narrative. These include the execution of St George, the baptism of the king, queen and princess, and the trial of the saint before the emperor. 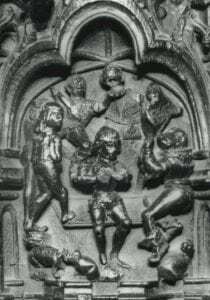 It is very possible that these images did originally form part of the sequence. 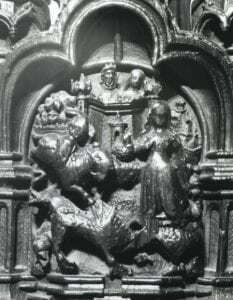 The popeys on the return stalls (the stalls facing the altar) were replaced in the late eighteenth century and we have no record to indicate the original scenes which were depicted in these. 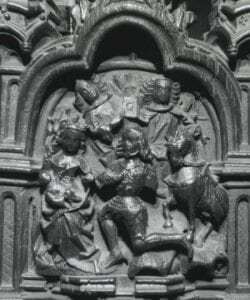 Nevertheless, the ten surviving popeys are a remarkable example of medieval storytelling and it is well worth taking the time to examine these beautiful carvings in more detail. Credit: Much of the information in this blogpost has been drawn from Samantha Riches, St George – hero, martyr and myth (Stroud: Sutton Publishing Limited, 2000).